Flattering50: Scarf Season is Coming: Are You Ready to Wrap? I've missed my scarves this summer. When I was in Paris in May (I still love saying that! ), women wore small silk scarves in white and muted colors. Very stylish! In a few more weeks, cooler days will begin to mix in with the hot ones. And once again, I'll step out in one of my favorite scarves, or, perhaps, a new one. Are you a scarf lady? Click "read more" below for 8 reasons to love scarves, for a videoclip showing 24 ways to tie a scarf, and for a few reasonable priced scarves like the Jones New York Animal Paisley Scarf - Size , Red ($49) above. . Here are my reasons for loving scarves. If you've got other reasons, leave a comment! Scarves are a 'hot fashion' trend. I don't consider myself a 'slave to fashion,' but I do like to look like I'm living in the here and now. Scarves are age appropriate. How many fashion trends can you say that about? Scarves offer fabulous neck coverage. Priceless! Scarves come in all colors. Want to hear people say, "You look great!'? Wear a scarf that complements your complexion--a color in your color season. Putting a flattering color close to your face will add to your glow. Scarves aren't a huge investment. On a limited budget this fall? A stylish scarf is an inexpensive way to perk up what's already in your closet. Scarves can be tied in a variety of ways (see videoclip below). Try tying a scarf in a new way this fall--it's fun! Scarves can dress up or down an outfit. It gives an outfit flexibility. Scarves are warm! Ha! This is why I started wearing scarves. With all the other reasons, I sometimes forget. Here's a video on 24 ways to tie a scarf. I can't always tell what makes one tying tip different from the next, but I definitely got some ideas I intend to try out in the coming months. You shouldn't have any trouble finding scarves. I realized how ubiquitous scarves had become a few weeks ago when I was in a Rite-Aide (a chain drug store) and saw a display of women's dress scarves. There's a scarf for every budget. Here's a sample of scarves, ranging from the Old Navy Womens Lightweight Burnout Scarves ($10) to an ultra soft and luxurious cashmere scarf ($103.50) from the Pure Collection. 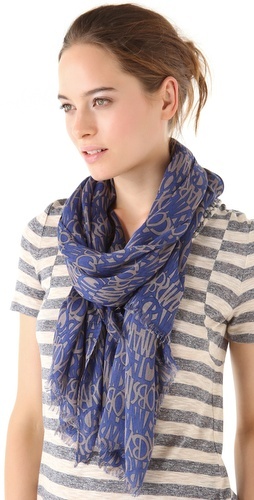 Shopbop has a nice assortment of scarves by designers for under $125, like the one by Marc by Marc Jacobs ($98) below. To view the entire collection, click on the photo or .